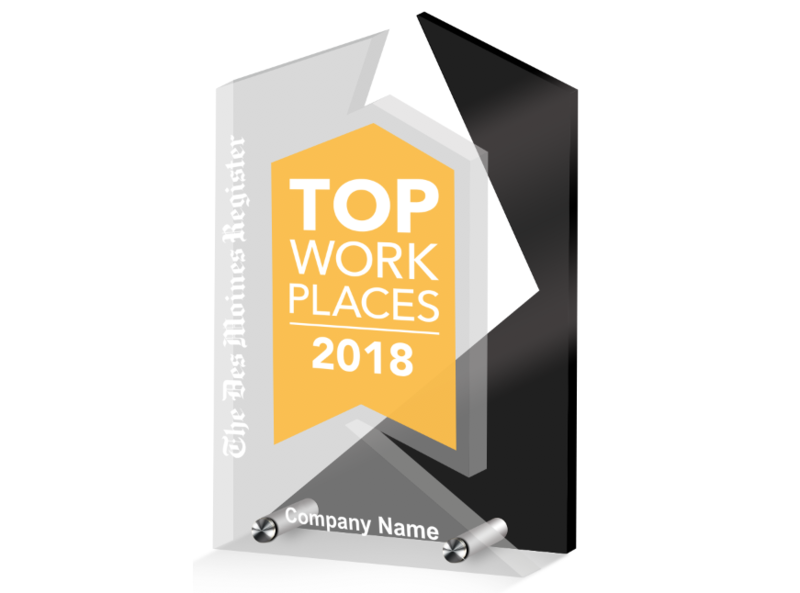 Including the Top Workplaces badge along with a quote, accolade or other related content in your advertising and marketing literature, sales material, newsletters, trade show, hiring and recruiting material or website significantly enhances your message and lends valuable credibility to your company, product or service. Click HERE to learn more. We can apply the Top Workplaces badge to all kinds of products. If you don’t see what you’re looking for, please send us a note and we’ll either source it for you or provide you with proper licensing so you can create something that meets your company’s individual needs. Click HERE to contact us. Please read this User Agreement carefully. Your use of this website, including to personalize, order or purchase any plaque or other product, constitutes acceptance by you and agreement by you to all of the terms, conditions and requirements of this User Agreement and creates a binding contract between you and American Registry, LLC ("American Registry"). If you do NOT agree with any of the terms, conditions or requirements of this User Agreement, do NOT access or otherwise use this website or any information contained on this website and do NOT personalize, order or purchase any plaque or other product offered on this website. American Registry can and may change any of the terms of this User Agreement or this User Agreement as a whole by posting an updated or changed User Agreement on this website. If any change, addition or modification is unacceptable to you, then you should cease using this website. Your continued use of this website constitutes acceptance by you and agreement by you to all of the changed, modified or added terms, conditions and requirements of this User Agreement and creates a binding contract between you and American Registry with respect to the entire updated or changed User Agreement. Please contact American Registry at info@amreg.com, if you have any questions about this User Agreement or its terms, conditions and requirements. You will not misrepresent or falsely state your identity (or the identity of your business or company) or your affiliation with or accreditation by any person, entity or business. American Registry is a company independent of the Council of Better Business Bureaus or any of its regional or local affiliates and does not claim to have the endorsement of any Better Business Bureau organization with respect to the products offered on this website. By using this website to personalize, order or purchase any plaque or other recognition product, you represent and warrant that you have the lawful and legal right or license to use, reproduce, create, distribute and/or display the content that you include in any plaque or other recognition product personalized, ordered or purchased through this website or through American Registry, whether the content consists of words, slogans, phrases, logos, emblems, photographs, drawings, pictures, endorsements, quotations, articles, or any other thing. You agree that it is solely your responsibility to determine your relationship or affiliation or accreditation with the Council of Better Business Bureaus or any of its regional or local affiliates. You also agree that it is also solely your responsibility to determine whether the Council of Better Business Bureaus or any regional or local affiliate imposes restrictions or limitations on the content or display of plaques or other promotional or advertising materials that may apply to you. By using this website to personalize, order or purchase any plaque or other recognition product, you represent and warrant that you have the right, authority or license to use, reproduce, create, distribute and/or display the plaque or other recognition product that you personalize, order or purchase through this website or through American Registry. American Registry's offer or sale of any plaque or other product does not indicate that American Registry approves of any content that you selected to include on the plaque or other product, or that American Registry has any opinion or knowledge about your right, authority or license to use, reproduce, create, distribute and/or display the plaque or other product. However, American Registry reserves the right to refuse to accept or to cancel any order that it knows is in violation of this User Agreement or infringes the copyright, trademark or intellectual property rights of others. You agree to waive and to give up your right to pursue any claims or lawsuits (including for indemnification, contribution or reimbursement) against American Registry and its employees, officers, directors, contractors, agents, parents, subsidiaries or affiliates for damages, losses and injuries of any kind that relate to, arise from or are based on your right, authority or license to create, use, reproduce, distribute and/or display a plaque or other product that was personalized or purchased through this website or through American Registry. You also agree to indemnify, defend and hold harmless American Registry and its employees, officers, directors, contractors, agents, parents, subsidiaries or affiliates from all claims, lawsuits, losses, damages, judgments and expenses, including reasonable attorneys' fees and other litigation or defense costs and expenses, which relate to, arise from or are based on (1) your right, authority or license to create, use, reproduce, distribute and/or display a plaque or other product that was personalized or purchased through this website or through American Registry, (2) your violation of this User Agreement, (3) your use of this website, and/or (4) your violations of any rights of a third-party, including but not limited to the Council of Better Business Bureaus or any of its regional or local affiliates. If for any reason you're not absolutely delighted with your purchase from American Registry, return it to us within 90 days for an exchange or refund of the product price. For a Return Authorization please call our Customer Care Dept at 866-964-0866 or email us at customerservice@americanregistry.com. Refund guarantee does not apply to shipping claims. We will remanufacture orders damaged or lost by UPS or other carrier. This guarantee is limited to replacement of the original order quantity or refund of the purchase price of the order. Maximum refund per order or customer is $1,000. But we will happily issue a replacement for any of our items. The Plaque Guarantee is the ONLY guarantee or warranty of any kind offered by American Registry. To the fullest extent permissible pursuant to applicable law, American Registry and its affiliates expressly disclaim any and all other warranties of any kind whether express or implied, including but not limited to any warranties of title and license, or implied warranties of merchantability, fitness for a particular purpose and non-infringement. American Registry does not make any warranty that (a) the website or its content will meet your requirements, or (b) that the website or service will be uninterrupted, timely, secure, or error free, or (c) the quality of any products, services, information, or other material purchased or obtained by you through the website or through American Registry will meet your expectations, or (d) that defects, if any, will be corrected, other than as expressly set forth in the then current version of the Plaque Guarantee. You agree that except as set forth in the then current version of the Plaque Guarantee, American Registry shall have no responsibility for any damages suffered by you in connection with the website or any content contained therein. You expressly agree that use of this website, including all content, data or software distributed by, downloaded or accessed from or through this website, is at your sole risk. You understand and agree that you will be solely responsible for any damage to your business, your computer system or loss of data that results from your connection to this website or the download of content, data and/or software from this website. No advice or information, whether oral or written, obtained by you from American Registry or through or from this website shall create any warranty not expressly stated in this User Agreement. You agree and acknowledge that American Registry's liability to you is limited to the fullest extent permitted by law. Accordingly, under no circumstances including, without limitation, its own negligence, shall American Registry or its affiliates, parents, subsidiaries, officers, employees, directors, agents, suppliers, or any other party involved in creating, producing or distributing American Registry plaques or related products or services be liable for any direct, indirect, incidental, special, consequential or exemplary damages, including but not limited to damages for loss of profits, goodwill, use, data or other intangible losses (even if American Registry has been advised of the possibility of such damages). This limitation includes and applies to your loss or damages of any kind, including those resulting from: (1) the content or information contained in any plaque or other product offered or sold by American Registry; (2) the location, manner or method that an American Registry plaque or other product is displayed or used by you or by a third party; (3) the use or inability to use this website; (4) the cost of procurement of substitute goods and services resulting from any goods, data, information or services purchased or obtained or messages received or transactions entered into through or from this website or American Registry; (5) unauthorized access to or alteration of your transmissions or data; (6) statements or conduct of any third party on this website or (7) any other matter relating to this website. Some jurisdictions do not allow the limitation or exclusion of liability for incidental or consequential damages, so some of the above may not apply to you. In such jurisdictions, liability is limited to the fullest extent permitted by law. You agree that the laws of the State of New York, without regard to any conflict or choice of laws provisions, govern any disputes that may arise between you and American Registry (including its employees, officers, directors, agents, parents, subsidiaries or affiliates) relating in any way to (1) your use of this website or (2) plaques or other products that you personalize, order or purchase through this website or through American Registry. You also agree that any such disputes shall be submitted to confidential arbitration in New York City, New York and that rules of the American Arbitration Association shall govern the arbitrations. To the fullest extent permitted by applicable law, no arbitration under this User Agreement shall be joined to an arbitration involving any other party subject to this User Agreement, whether through class arbitration proceedings or otherwise. You also agree that before submitting any such dispute to arbitration, the aggrieved party will first attempt to resolve the dispute by mediation, with the costs of the mediation to be split evenly between you and American Registry (or, as applicable, any parents, subsidiaries or affiliates of American Registry). To that end, you agree that you are prohibited from commencing or otherwise submitting any such dispute to arbitration against American Registry (or any of its officers, directors, employees, agents, parents, subsidiaries or affiliates) until you propose in writing to American Registry or its designated attorney the name of at least one available neutral mediator in New York City, New York and agree to share evenly in the costs of the mediation and thereafter, American Registry has either refused in writing to engage in the mediation or 45 days have elapsed without American Registry agreeing to engage in the mediation. If any provision of this User Agreement is invalid, illegal or unenforceable under any applicable statute or rule of law, such provision shall be deemed amended to achieve as nearly as possible the same economic effect as the original provision and the remaining provisions of this User Agreement shall in no way be affected or impaired.